Accra – IOM, the UN Migration Agency, this week (26/02) officially launched a two-year project Integrating Migration into National Development Plans: Towards Policy Coherence and the Achievement of SDGs at National and Global Levels, funded by the United Nations Department of Economic and Social Affairs (UN DESA) through the 2030 Agenda for Sustainable Development Sub-Fund of the Peace and Development Fund, of which the People’s Republic of China is a major contributor. Implemented by IOM Ghana, the project supports the Governments of Ghana and Ethiopia in mainstreaming migration into national development policies and achieving policy coherence in line with the Sustainable Development Goals (SDGs) and the 2030 Agenda for Sustainable Development. Lou Danzhu, Chief of Political Section of the Chinese Embassy in Ghana, pledged the support of People’s Republic of China towards the attainment of the Goals and emphasised the importance of migration for development. 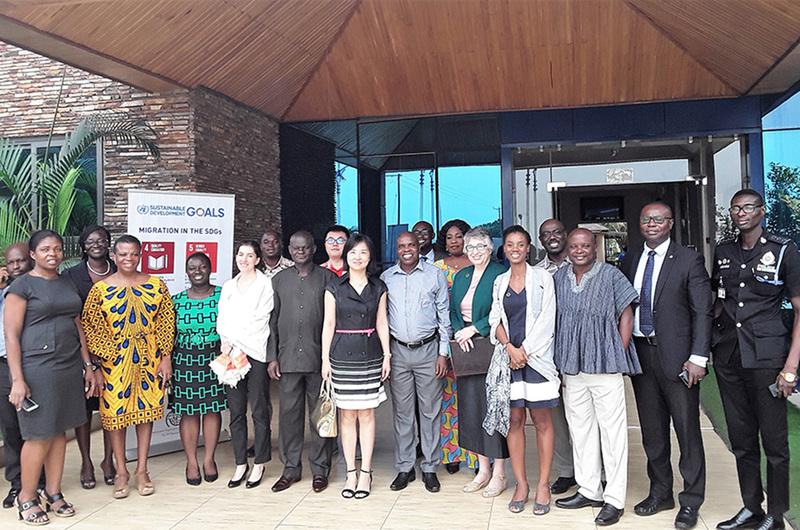 In Ghana, the launch of the project coincided with the opening of a two-day capacity-building workshop for 22 members of the inter-agency Technical Working Group (TWG) on migration, co-chaired by the Migration Unit of the Ministry of Interior. The TWG aims to track progress on migration-related SDGs and ensure that migration is mainstreamed in respective national development policies. Based on priorities identified by the TWG, two initiatives will be selected from the 2016 National Migration Policy (NMP) action plan and will be funded and implemented under this project. Dominic Agyemang, Deputy Director of Ghana’s Ministry of Interior’s Migration Unit, commended IOM for its support and expressed the hope that the project will be useful in the establishment of the Ghana National Commission on Migration (GNCM). In Ethiopia, a similar capacity-building workshop was conducted in early February (05/02) in close collaboration with the National Anti-Trafficking and Smuggling Taskforce Secretariat under the Attorney General’s Office. 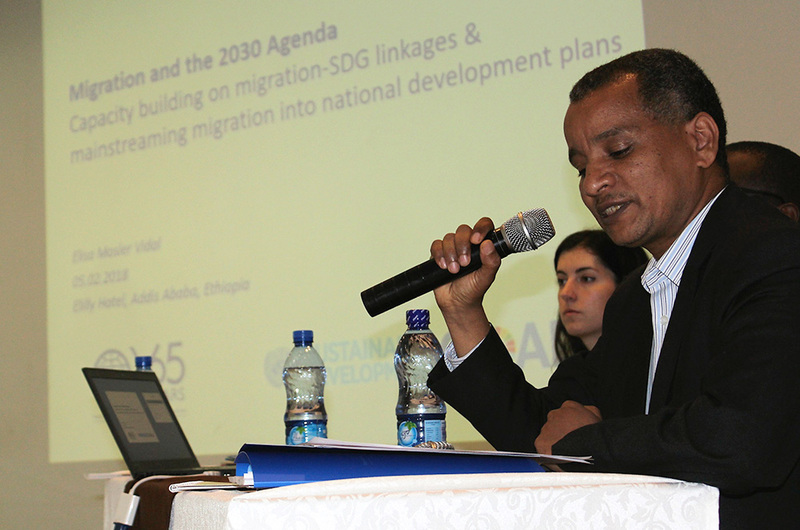 The workshop aimed to sensitize 15 representatives of core ministries on the linkages between migration and SDGs and the importance of mainstreaming migration into national development plans. “I am appreciative that IOM, in collaboration with stakeholders, has helped make migration management a global phenomenon,” said Yusuf Jemaw, Director of the International Cooperation, Human Rights and Anti-Human Trafficking Directorate of the Federal Attorney General Office. Two initiatives will also be selected from the National Anti-Trafficking and Smuggling Taskforce Secretariat strategic plan in Ethiopia for funding and implementation under this project.